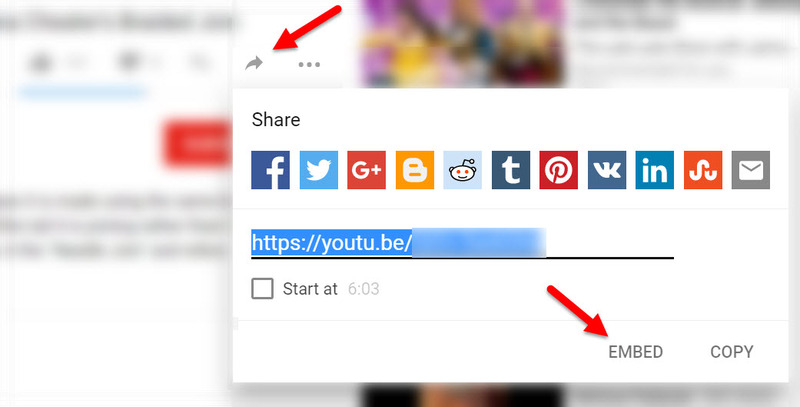 YouTube recently upgraded their sharing options and now it seems a bit harder to pick a variety of sizes for YouTube videos to share on your blog or website. If you click the Share icon you will get a 560px wide HTML video code. If your blog posting area is wider or you want to show the video on your homepage you may want a wider layout. While I didn’t find a perfect solution I did find a workaround. In the past, YouTube would give you the option to pick the size you want to make your video code but for me at least, that option is no longer available. I am providing you with a variety of YouTube video sizes and how you can grab the HTML embed code for each. Depending on the blog theme you use some themes, will automatically resize the video to fit the screen and others won’t. The same goes for the mobile theme you use. You can also manually change the size of the YouTube video code to fit the space. Just change the width and height in the HTML code they give you to match one of these YouTube video sizes. Note: Sometimes you blog post isn’t any of these sizes so you can make the video any size you like. You should keep the proper dimensions so it doesn’t cut off the side or the bottom. Here are some sizes that work well for standard blog posts areas. Find the video you want to use on your website. Thanks! bookmarking for quick reference guide. Thanks so much for the video. But I noticed whenever I adjust the code, its goes back as before when I go back for the code. What do you think? That totally works!! Excellent job figuring that out! Thank you. YouTube are a nightmare, whoever thought taking away control of size was a good thing! Thank you, it’s so upsetting that YouTube changed it so we can’t adjust the embed sizes. But you saved me with this post, thanks again! Finally someone knows how to do this!! !